Last September, our mother flew up with my brother, Warren, on a budget airline -- the only one that offers direct flights between LAX and our little town up here in Western Washington. Our mom is the wonton lady. Whenever she shows up anywhere, she pulls out a foil-wrapped package of thawed wonton wrappers from the best dumpling place in Chinatown. Then, she'll ask if you have any pork, ginger, garlic and scallions (which of course you do, having prepared for her arrival) and gets going like a productive elf until the dining room table is covered with cornstarch-dusted trays of dumplings. Flo is what we call our mom, mostly behind her back because even though she has an "American" name (Florence), she has always hated it. As her evil spawn, we get a (juvenile) kick out of freely throwing about the name she always complains about people using -- even though when people ask, she tells them, with a smile, that her name is Florence. "How was the trip with Flo?" I asked Warren. He rolled his eyes then explained what had happened. In her suitcase, Flo had packed frozen homemade wontons -- not just the frozen skins, but the actual dumplings, pork filling and all. Being oblivious during the check-in process since after over forty years in this country, her grasp of the English language is barely functional at best, she had allowed Warren to do the talking while she stood off to the side. Warren and I long ago agreed, after seeing a photo of Nelson Mandela, the South African leader and icon, that our mother bore a striking resemblance to him -- only more Chinese. We thought it was probably the similar haircut, the close-cropped, graying frizz perched on the top of her head. I pictured her now at the airline ticketing counter staring dreamily away with her Nelson Mandela hairdo, her small hands pushed into the pockets of the nubby maroon sweater she wears almost every day. After Warren thunked Flo's black bag onto the scale, the airline agent immediately declared it overweight. He stated that there would be an additional charge of $50. My brother is the perfect example of the good Chinese son. Rather than make his mother remove some of the clumps of frozen meat and dough from her bag, he paid the fee. Filial duty reigned. He let out what resembled a half groan, half laugh. See, not to sound disrespectful, but our mother was never much of a cook. Our childhood memories of her efforts in the kitchen lean toward images of soggy food and things with burnt edges. Maybe it had something to do with her being a single mom who worked as a sweatshop seamstress twelve hours a day. It didn't leave much time for her to think about cooking. She only turned into the wonton lady once we became grownups and moved away from home. She began traveling to us for extended visits that would inevitably turn into wonton making extravaganzas. Even though we now eat her wontons, which are certainly good, we still approach them with remnants of our childhood skepticism. For the rest of the trip, Warren and I referred to the foil-wrapped lumps as “the fifty-dollar wontons.” As in, “Do you want to eat some fifty-dollar wontons?” Then, we would laugh. We didn’t tell our mother about it. She would not have found any of it amusing, especially since she has a belief that if you wrap something in foil and shove it into your luggage, no one will know it is there; it won’t even show up on the airport X-ray machine. She explained this to me once with utter conviction. I didn't argue. We all need to have things to believe in. Wontons are not supposed to weigh you down. With a small piece of filling surrounded generously by paper thin dumpling skin, a wonton is meant to float in a bowl of broth as weightlessly as a cloud. When you eat a wonton, you are as the name itself explains, swallowing a cloud. Won, cloud. Ton, to swallow. These shitake and chard dumplings float ethereally while offering flavors that are entirely of the earth. 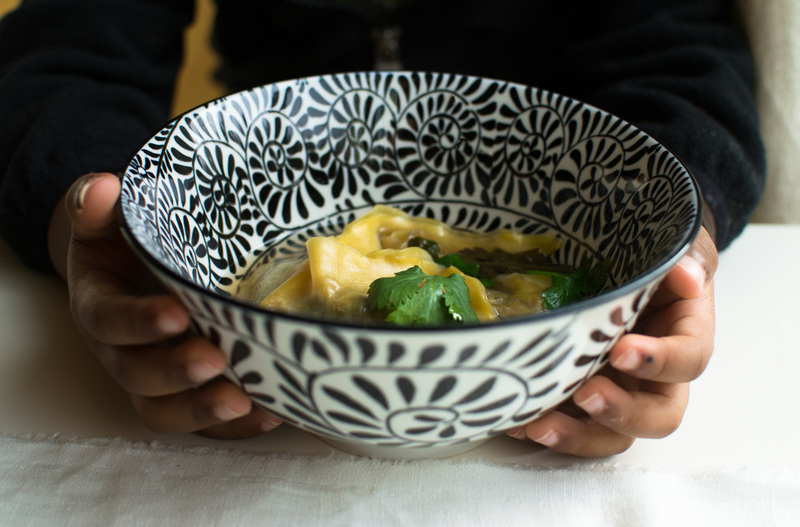 If our mother's wontons provide us children with a solid reminder of who we are and where we come from, perhaps my dumplings speak more of what we have moved toward, or even become. We may seem a little lighter, but our burdens are different: we are the next generation. I'll make these for Flo the next time she is here. Cover tomatoes with hot water while prepping mushrooms, chard, onions, garlic. Meanwhile, heat oil over medium heat in a large pan. Add chard and saute until wilted. Remove from pan and press chard with the back of a wooden spoon, draining away the liquid. Allow chard to cool. Remove softened tomatoes from water and squeeze lightly then dice. In a large bowl combine mushroom mince, tomatoes, onions, garlic, chard, soy sauce, sesame oil, salt and pepper. Prepare a baking tray: dust lightly with cornstarch. Add a small amount of water to a bowl for dipping your fingers in while folding the dumplings. Place a teaspoon or so of filling in the center of a wonton wrapper. Wet fingertip and run a long two edges and then fold skin over to form a triangle. 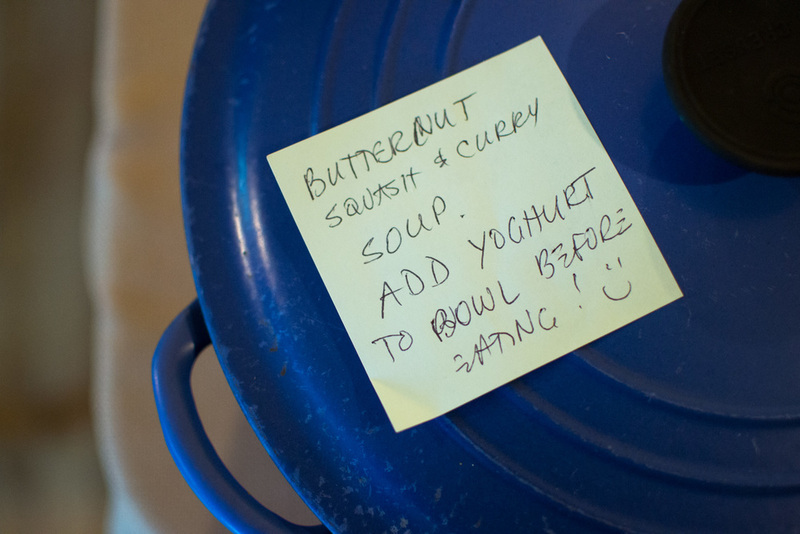 Press to seal tightly to prevent filling from spilling out into your broth. Again, it's very important that you have a good, tight seal. From here, dumplings may be placed on prepped sheets so that they do not touch, dusted with an additional bit of cornstarch, and placed in the freezer. Freeze for at least 2 hours, then place in freezer bags to store. For cooking: Bring pot of water to boil. Heat broth in a separate pot. Place dumplings in boiling water for 1-2 minutes. Gently remove with a slotted spoon, placing them into heated broth for another minute. Serve in bowls with chopped green onions or cilantro. Drizzle with sesame oil.